The Abridged: It took a team of some 200 craftsmen from all over India to bring owner Giles’ master plan to fruition. Four villas, inspired by the ‘Tropical Modernism’ movement, are a homage to the works of Sri Lankan architect Geoffrey Bawa. Clean lines and open-plan spaces abound, and the indoor-outdoor living spaces give a sense of peace and oneness with nature. It’s perfect for couples or families seeking seclusion. Whether in bed, the pool, the dining or living area, you constantly feel connected with the outside world. 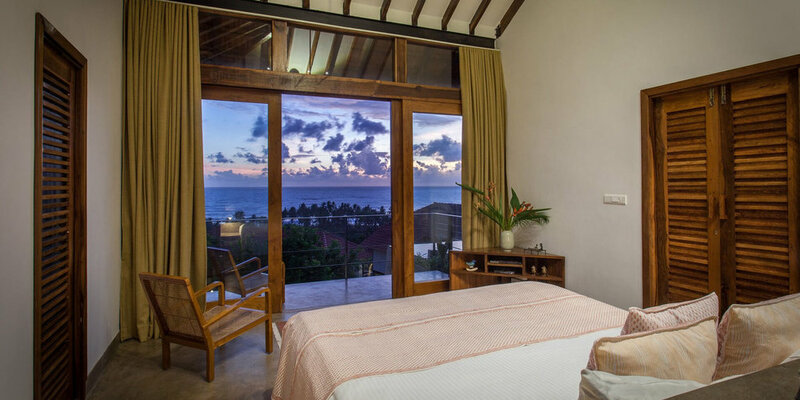 The villas are carefully designed to let the views do the talking. Floor-to-ceiling glass doors fill rooms with natural light. White linens and mauve block prints are simple yet chic against rustic grey cement and coconut-wood furniture. Each villa has 2 ensuite kingsize bedrooms, a living area and a private sit-out overlooking your pool; drawing the blackout curtains in the morning never gets tiresome. There’s a TV in every room but you won’t spend much time watching it. Bearing Sanskrit names, each of the 4 villas is almost identical in design. Arka, is closest to the entrance and good for those that don’t like climbing stairs, whilst Amaresha has a small grassy area behind the pool, great for families. We stayed in Inaya which (though a tough choice) had the best views. At quite an altitude sits Varenya, which offers the most privacy of all the villas. For an unforgettable group holiday, you can take over the entire place. The setting? An unexplored stretch of the Konkan Coast framed by swaying palm trees. Save for a few local holiday-makers, the town of Malvan does not attract a crowd, although you may spot the odd parasailor gliding past neighbouring Tarkarli Beach: the place for watersports and diving. There’s no restaurant on-site but after a day spent languishing by your pool, the attentive catering team will come and take your order a few hours before serving it to you in the privacy of your villa. Your first dinner comes free with compliments of i-escape. Cordon Bleu-trained chef Shagun Mehra has created a distinctive menu of stand-out dishes, a saving grace as there’s nothing around for miles. And that is exactly why you’d come here. There are no restaurants within a sensible distance, but thankfully Cordon Bleu-trained chef Shagun Mehra and her team are outstanding. Celebrating Malvan’s spicy, seafood cuisine, the menu goes a long way beyond the usual dishes of Pomfret and kingfish. The kitchen works in tandem with local fisherman to ensure the freshest and most unusual catch of the day (stingray, anyone?) and staff are taught authentic methods of preparation. Food is locally sourced as much as possible, resulting in innovative Continental creations with an Indian twist. Served in the comfort of our villa, the Malabar preparation (a regional dish with a spicy tomato and coconut sauce, wrapped in a banana leaf parcel) was refreshingly light and perfectly steamed. The Thai fish cakes, accompanied by a tangy salad of julienned vegetables, were so good we ordered them twice. The chocolate chilli ganache was rich, spicy and sweet enough to satiate even our sweet tooth. For something a little unusual, try the cinnamon churros made from paneer (cheese). Open all year round. The south Indian coastline is generally best visited between November and February when the weather is dry and the temperatures in the low 30s. The Konkan Coast makes a great alternative to Goa’s Christmas and New Year crowds. During the monsoon (typically May-August), special screens are erected to protect the villa’s indoor-outdoor living spaces. It would be an utterly romantic spot to hole up during the dramatic downpours. Wi-Fi: Yes, not bad. Considering. Pet Friendly: No. Room Service: At the drop of a hat.